My final recital at the Schola Cantorum Basiliensis will take place on May 27th. As we're about eight weeks away from it, I'm required to submit a number of documents to the secretaries including some detailed program notes. My program is based around John Ernest Galliard, known best today for his bassoon sonatas. He was, however, an important figure in London's musical circles and his writings (or what we believe to be his writings) give us a great deal of information on the first years of opera in London. 18th century playhouse would look like. During my research, I came across an hilarious letter in The Spectator, a daily publication founded by Joseph Addison and Richard Steele which was in circulation in 1711 and 1712. I've copied the entire story below, which has been republished by Project Gutenberg. If concert halls today had their own "Trunk-Maker", it might make for a much more interesting experience! There is nothing which lies more within the Province of a Spectator than publick Shows and Diversions; and as among these there are none which can pretend to vie with those elegant Entertainments that are exhibited in our Theatres, I think it particularly incumbent on me to take Notice of every thing that is remarkable in such numerous and refined Assemblies. 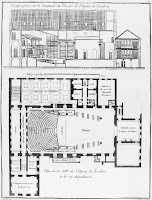 It is observed, that of late Years there has been a certain Person in the upper Gallery of the Playhouse, who when he is pleased with any Thing that is acted upon the Stage, expresses his Approbation by a loud Knock upon the Benches or the Wainscot, which may be heard over the whole Theatre. This Person is commonly known by the Name of the Trunk-maker in the upper Gallery. Whether it be, that the Blow he gives on these Occasions resembles that which is often heard in the Shops of such Artizans, or that he was supposed to have been a real Trunk-maker, who after the finishing of his Day's Work used to unbend his Mind at these publick Diversions with his Hammer in his Hand, I cannot certainly tell. There are some, I know, who have been foolish enough to imagine it is a Spirit which haunts the upper Gallery, and from Time to Time makes those strange Noises; and the rather, because he is observed to be louder than ordinary every Time the Ghost of Hamlet appears. Others have reported, that it is a dumb Man, who has chosen this Way of uttering himself when he is transported with any Thing he sees or hears. Others will have it to be the Playhouse Thunderer, that exerts himself after this Manner in the upper Gallery, when he has nothing to do upon the Roof. But having made it my Business to get the best Information I could in a Matter of this Moment, I find that the Trunk-maker, as he is commonly called, is a large black Man, whom no body knows. He generally leans forward on a huge Oaken Plant with great Attention to every thing that passes upon the Stage. He is never seen to smile; but upon hearing any thing that pleases him, he takes up his Staff with both Hands, and lays it upon the next Piece of Timber that stands in his Way with exceeding Vehemence: After which, he composes himself in his former Posture, till such Time as something new sets him again at Work. It has been observed, his Blow is so well timed, that the most judicious Critick could never except against it. As soon as any shining Thought is expressed in the Poet, or any uncommon Grace appears in the Actor, he smites the Bench or Wainscot. If the Audience does not concur with him, he smites a second Time, and if the Audience is not yet awaked, looks round him with great Wrath, and repeats the Blow a third Time, which never fails to produce the Clap. He sometimes lets the Audience begin the Clap of themselves, and at the Conclusion of their Applause ratifies it with a single Thwack. He is of so great Use to the Play-house, that it is said a former Director of it, upon his not being able to pay his Attendance by reason of Sickness, kept one in Pay to officiate for him till such time as he recovered; but the Person so employed, tho' he laid about him with incredible Violence, did it in such wrong Places, that the Audience soon found out that it was not their old Friend the Trunk-maker. It has been remarked, that he has not yet exerted himself with Vigour this Season. He sometimes plies at the Opera; and upon Nicolini's first Appearance, was said to have demolished three Benches in the Fury of his Applause. He has broken half a dozen Oaken Plants upon Dogget and seldom goes away from a Tragedy of Shakespeare, without leaving the Wainscot extremely shattered. The Players do not only connive at his obstreperous Approbation, but very cheerfully repair at their own Cost whatever Damages he makes. They had once a Thought of erecting a kind of Wooden Anvil for his Use that should be made of a very sounding Plank, in order to render his Stroaks more deep and mellow; but as this might not have been distinguished from the Musick of a Kettle-Drum, the Project was laid aside. In the mean while, I cannot but take notice of the great Use it is to an Audience, that a Person should thus preside over their Heads like the Director of a Consort, in order to awaken their Attention, and beat time to their Applauses; or, to raise my Simile, I have sometimes fancied the Trunk-maker in the upper Gallery to be like Virgils Ruler of the Wind, seated upon the Top of a Mountain, who, when he struck his Sceptre upon the Side of it, roused an Hurricane, and set the whole Cavern in an Uproar. It is certain, the Trunk-maker has saved many a good Play, and brought many a graceful Actor into Reputation, who would not otherwise have been taken notice of. 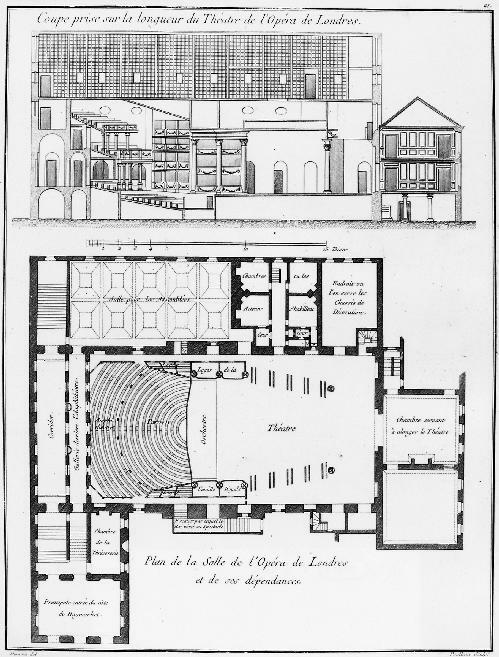 It is very visible, as the Audience is not a little abashed, if they find themselves betrayed into a Clap, when their Friend in the upper Gallery does not come into it; so the Actors do not value themselves upon the Clap, but regard it as a meer Brutum fulmen, or empty Noise, when it has not the Sound of the Oaken Plant in it. I know it has been given out by those who are Enemies to the Trunk-maker, that he has sometimes been bribed to be in the Interest of a bad Poet, or a vicious Player; but this is a Surmise which has no Foundation: his Stroaks are always just, and his Admonitions seasonable; he does not deal about his Blows at Random, but always hits the right Nail upon the Head. The inexpressible Force wherewith he lays them on, sufficiently shows the Evidence and Strength of his Conviction. His Zeal for a good Author is indeed outrageous, and breaks down every Fence and Partition, every Board and Plank, that stands within the Expression of his Applause. As I do not care for terminating my Thoughts in barren Speculations, or in Reports of pure Matter of Fact, without drawing something from them for the Advantage of my Countrymen, I shall take the Liberty to make an humble Proposal, that whenever the Trunk-maker shall depart this Life, or whenever he shall have lost the Spring of his Arm by Sickness, old Age, Infirmity, or the like, some able-bodied Critick should be advanced to this Post, and have a competent Salary settled on him for Life, to be furnished with Bamboos for Operas, Crabtree-Cudgels for Comedies, and Oaken Plants for Tragedy, at the publick Expence. And to the End that this Place should be always disposed of according to Merit, I would have none preferred to it, who has not given convincing Proofs both of a sound Judgment and a strong Arm, and who could not, upon Occasion, either knock down an Ox, or write a Comment upon Horace's Art of Poetry. In short, I would have him a due Composition of Hercules andApollo, and so rightly qualified for this important Office, that the Trunk-maker may not be missed by our Posterity.